Saturday’s UFC STL event is in the books, and now that the dust has settled in Missouri, it’s time to go to the scorecard to see who the big winners were at Scottrade Center. As soon as the fight between Jeremy Stephens and Dooho Choi was announced, I knew it was going to be a barnburner for as long as it lasted, and it was. But I also knew that if Choi got tagged by Stephens the way he did by Cub Swanson, it was going to be a bad night, because while “Killer Cub” can crack, the “Lil’ Heathen” has even more on his fastball, and once he hurt Choi on Sunday night, Stephens got him out of there. It’s put the Iowa veteran in a nice spot to kick off the new year, and hey, at 31, he’s still got plenty left in the tank to make a run at the belt. I love spinning, jumping, acrobatic things as much as anyone, but there’s something about a Darren Elkins bout that will always have me watching on fight night. The epitome of a gritty, Midwestern grinder, Elkins proved once again on Sunday that no matter what happens, unless you knock him out, he’s going to keep coming forward, and more often than not, he’ll find a way to win. Michael Johnson’s left hand was finding a permanent home on Elkins’ face in the first round, but in the second, it was time for the “Damage” to roar back, and he did just that. That’s six straight for a guy who may very well be in the title picture by the middle of the year. The fact the Jessica-Rose Clark still showed up to fight after getting her Las Vegas home robbed and her cat killed last week says all you need to know about her and her spirit. To then beat the heavily favored Paige VanZant says even more about the Aussie flyweight as a fighter. That’s two UFC fights she was supposed to lose (against PVZ and Bec Rawlings) that she won. The next time out, don’t expect “Jessy Jess” to be an underdog. After the hype machine went into overdrive for Jessica Eye’s UFC debut in 2013, she went through a horrible stretch where she was consistently fighting either killers or opponents that were physically imposing for a natural flyweight – or both. So if you looked at her 1-5, 1 NC record and didn’t know her history, you were wondering why she was still in the UFC. 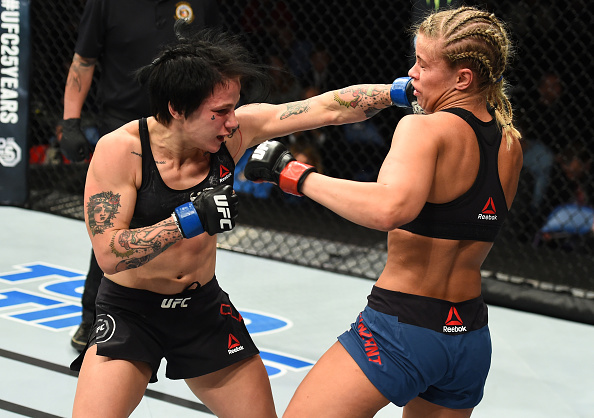 On Sunday, she showed why with a hard-fought win over Kalindra Faria in her first UFC bout at flyweight. It wasn’t the best “Evil” Eye, but she showed enough glimpses to make it clear that it’s a new day for her at 125 pounds.